Akeret et al., reviewed prospectively collected clinical and imaging data of all patients operated on a supratentorial intraparenchymal primary brain tumor at the Neuroscience Center Zurichbetween January 2009 and December 2016. The effect of tumor histology, anatomical location and white matter infiltration on seizure prevalence and semiology were assessed using uni- and multivariate analyses. Of 678 included patients, 311 (45.9%) presented with epileptic seizures. 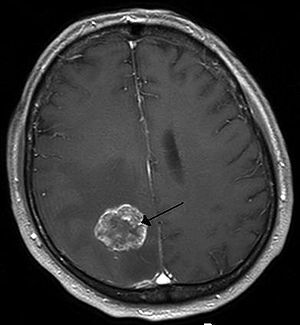 Tumor location within the central lobe was associated with higher seizure prevalence (OR 4.67, 95% CI: 1.90-13.3, p = .002), especially within the precentral gyrus or paracentral lobule (100%). Bilateral extension, location within subcortical structures and invasion of deeper white matter sectors were associated with a lower risk (OR 0.45, 95% CI: 0.25-0.78; OR 0.10, 95% CI: 0.04-0.21 and OR 0.39, 95% CI: 0.14-0.96, respectively). Multivariate analysis revealed the impact of a locationwithin the central lobe on seizure risk to be highly significant and more relevant than histopathology (OR: 4.79, 95% CI: 1.82-14.52, p = .003). Seizures due to tumors within the central lobe differed from those of other locations by lower risk of secondary generalization (p < .001). Topographical lobar and gyral location, as well as extent of white matter infiltration impact seizure risk and semiology. This finding may have a high therapeutic potential, for example regarding the use of prophylactic antiepileptic therapy1). Brain mapping with direct electrical stimulation is usefull when the tumor is located near or has infiltrated the central lobe. To analyze the surgical findings with direct electrical stimulation of the cortex and white matter under general anesthesia during surgery for brain tumors related to the central lobe. We studied 42 patients operated on from June 2000 to June 2003. We analyzed surgical findings and details of brain mapping. The mean value of the intensity of the stimulus was greater among those who presented motor deficit prior to surgery (p = 0.0425) and edema on MRI (p = 0.0468) or during anesthesia with continuous propofol (p = 0.001). The functional mapping of the central lobe may be influenced by severe motor deficit, edema on MRI and propofol’s anesthesia 2). Akeret K, Serra C, Rafi O, Staartjes VE, Fierstra J, Bellut D, Maldaner N, Imbach LL, Wolpert F, Poryazova R, Regli L, Krayenbühl N. Anatomical features of primary brain tumors affect seizure risk and semiology. Neuroimage Clin. 2019 Jan 25;22:101688. doi: 10.1016/j.nicl.2019.101688. [Epub ahead of print] PubMed PMID: 30710869. Brainer-Lima PT, Brainer-Lima AM, Brandt CT, Carneiro GS, Azevedo HC. [Intraoperative mapping of motor areas during brain tumor surgery: electrical stimulation patterns]. Arq Neuropsiquiatr. 2005 Mar;63(1):55-60. Portuguese. PubMed PMID: 15830066.